Never wait too long, never pay too much. 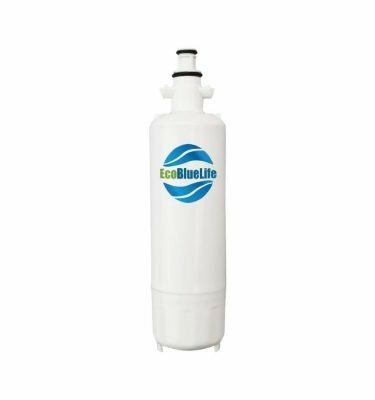 Save 5% when you select Upstream – choose a qualifying EcoBlueLife.com™ filter and have it automatically delivered every 6 months. • Effectively reduces chlorine taste and odor as well as typical contaminants found in tap water. 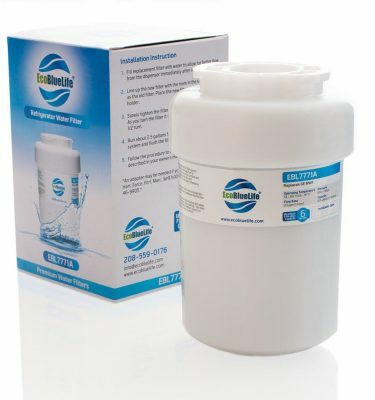 • Get healthier drinking water for less money – a cost effective alternative to OEM filters. • Made from renewable Activated Carbon Media – environmentally friendly. 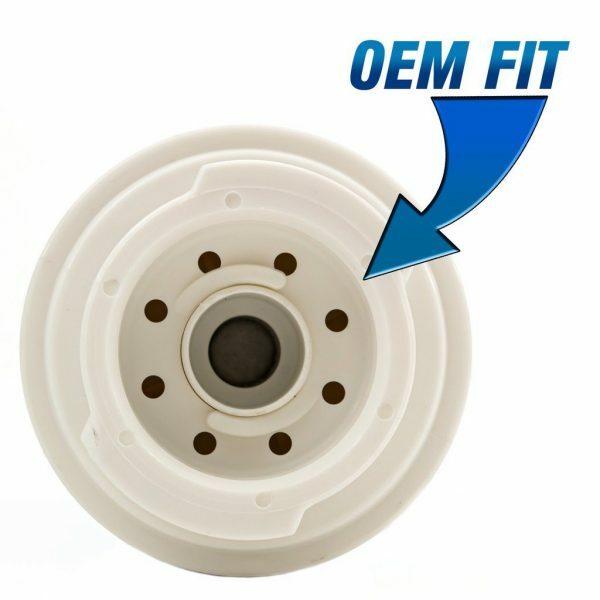 • Quick and easy to install – Our filters are the same size and shape as the factory model at a fraction of the cost. 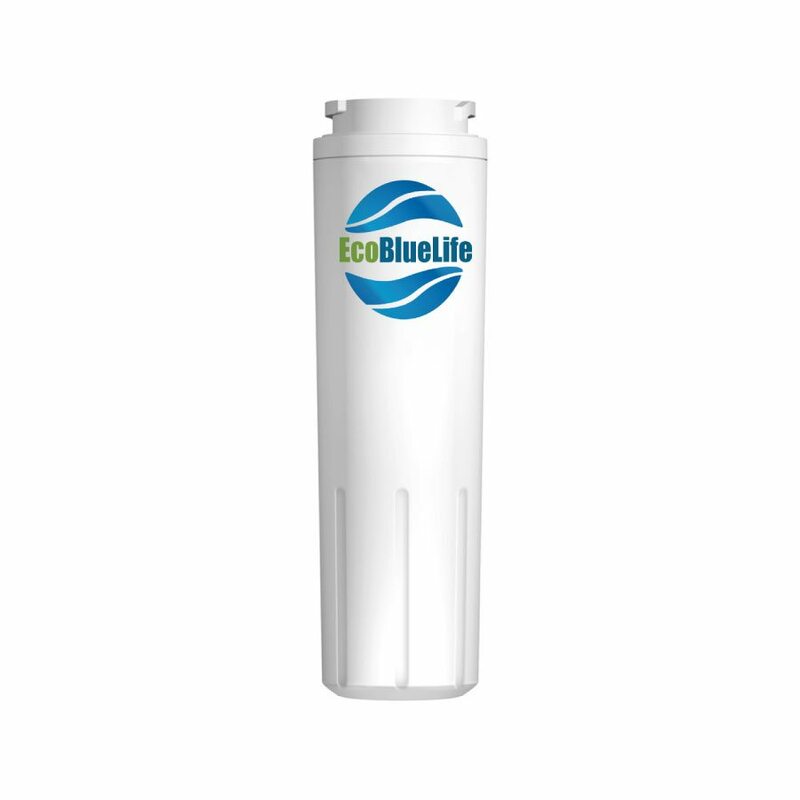 • EcoBlueLife filters will provide 300 gallons of crisp, clear drinking water. 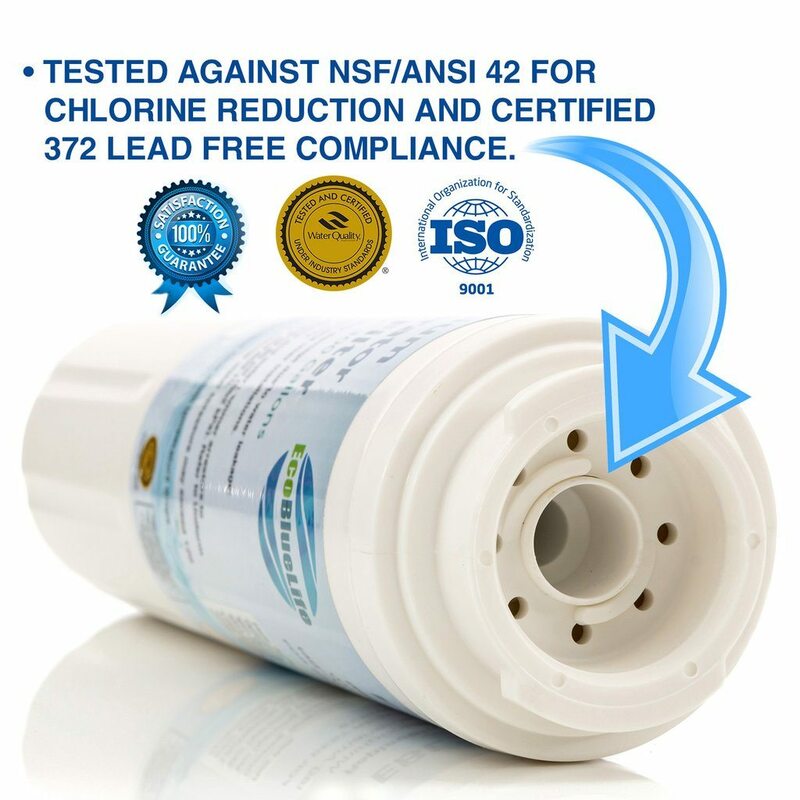 • Tested and professionally certified by the Water Quality Association to NSF/ANSI 42 Standards for Chlorine Reduction and tested and certified by WQA to NSF/ANSI 372 standards for Lead Free Compliance. Professionally certified by the Water Quality Association. • Tested and certified by WQA to NSF/ANSI 42 Standards for Material Safety and Structure Integrity. • All components and filters are tested to meet EC 1935/2004 Regulations. • Manufactured in an ISO9001 facility. Seems like a very good product that is easy to install. Great service! Delivered on time and intact. Paid a little more for this water filter but well worth the cost. All the cheap ones I purchased clogged only a couple of months after installation. This one is going strong and shows no sign of diminished water flow. This filter was easy to install liked the date stickers to know when to replace the filter again!! Easy install. FOLLOW THE DIRECTIONS BEFORE USE. I installed my pump today in s large ceramic bowl. I added rocks and piece of plastic screen over the. Pump to hold the rocks. My pump makes a lovely soumding splash of water. Very relaxing. Came quickly, fit as stated and really improved the water quality. Filtered out the rust taste. Arrived on time, functions as promised. Thank you! Second order of this product. Easily installed with clear instructions. Pricing was good. Great price, easy installation , fits my Whirlpool refrigerator…no negatives. Works just as well as the filter that is over twice the price! I’m happy with the product and the quick shipment. This is a fantastic filter for our Maytag fridge. I had tried a couple others before this and they changed the way my water tasted and not in a good way. 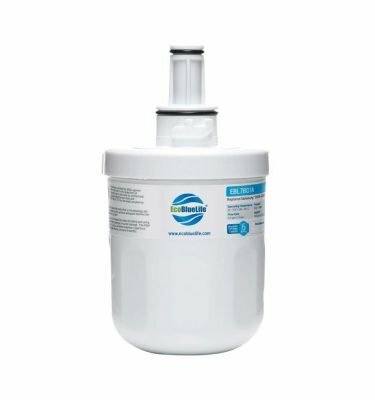 This EcoBlueLife filter keeps the water tasting great for nearly a year. It’s awesome! Fit perfectly into my kenmore fridge. The water tastes great. Bought this for my Maytag fridge and it works just like the name brand model. Easy to install; works great. Easy to install and so far it works great. Provides good water flow – no different from more expensive filter that came with the refrigerator. Works great! Thanks for a great product! This was so much cheaper than other brands so I was a little hesitant buying it, but I did and it seems to be working fine. Same great water pressure. Easy to install. Great price and easy to install. Everything five stars and this is my second order and have no complaints. I’ve used this filter before and they work Great. Came quickly, installed as expected, no leaks. So far so good! I’ve used one and it works great.! Simple order process delivered on time. Easy install. Works great. The product fit like a glove in my fridge. It does what it’s supposed to do. 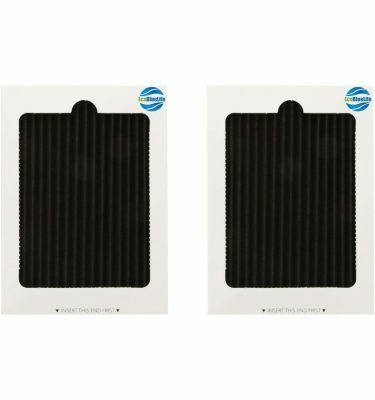 I bought two hoping I wouldn’t have to send it back, so I just saved some money by not having to buy the filter the brand told me to get! Fit my whirlpool frig just find and water taste good if not better than the one that came with the frig that cost double. Exact filter needed, at a nicely reduced cost…sent to my front door. Reasonable price for what I needed. It was what I wanted – delivered in good condition and on time – Thanks!! My stars tell you my opinion. Product as described and good company!! Great quality, fast shipping, good tasting water, and lasted the normal life cycle of any other filter. Was perfec!! Thank you so much, nice to know I can get them that fast!! This is a product that I have found very satisfactory in the past. The most recent filter I ordered released a lot of charcoal into the water after I first installed it. Initially I was alarmed and worried that the filter was defective but after a few minutes it cleared and has been functioning perfectly since. 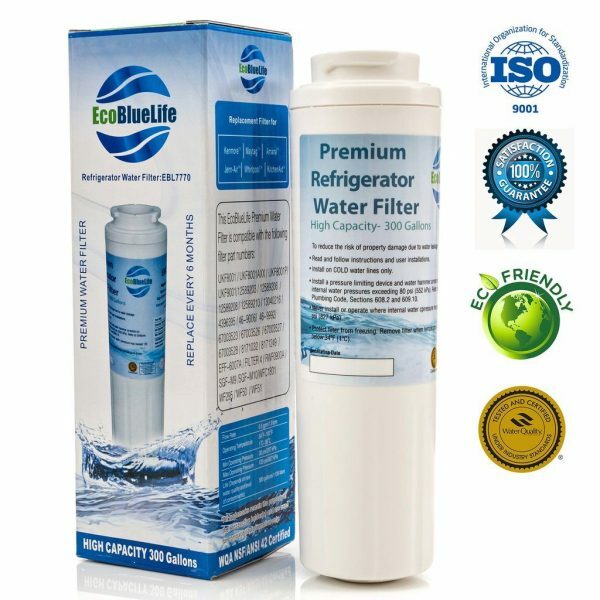 The previous Eco Life filters I had installed in my refrigerator did not exhibit this effect but since this most recent one cleared up I would say that overall I have been very happy with this product. I tried a different brand but did not think the water tasted as good. I probably would prefer to give this product 4 1/2 stars but that is not an option. I have a Maytag and this filter is a great replacement for the UKF8001. There’s a huge increase in water pressure with this filter. Received the order on time as expected. Fits great and easy to install. So my fridge has a way to tell it exactly how much water you want to come out. With the filter that came with my brand new refrigerator the amount I told it to do would never be right. Also drastically less. With this filter if I tell it 2 cups, I get damn close to two cups.So it’s cheaper than the official and works better. Excellent product and the right price. This is the third one I’ve purchased here and I’m very pleased with the quality and functionality of the filter. Easy to install. Does the job nicely. Easy to install, quick shipping, good instructions and seems to work well so far. Water tastes fine and good clear color. Fit was not perfect, but working fine. Works great on our Whirlpool & much cheaper than the “Brand names”. Great price, and works just as well as others that are nearly twice as much money. Will buy again. Easy install and water flow is strong! My fridge requires this filter for water & ice – and Rojo, LLC’s EcoBlueLife Water Filters are the filter I order from regularly. Their delivery is prompt and the filter does its job. Consistent & dependable! Works great. Just as ordered. Easy fit and installation. I fits does the job and costs less than the OEM. Fit perfect, work great! Only brand we’ve used! Fast delivery and very easy to install. Perfect replacement filter for my KitchenAid refrigerator at half the price of the original filter. Filter fit perfectly into my Fisher & Paykel fridge. No discernible filter taste. Arrived on time & was the correct model to fit our fridge. Filters arrived on time and as described. Popped one right in with no problem, great product at a great price. Good water filter, gives our water a fresh taste from inside the fridge.